The last time Chris and I went to Westcave Preserve I was browsing through their small library of local and natural history books. 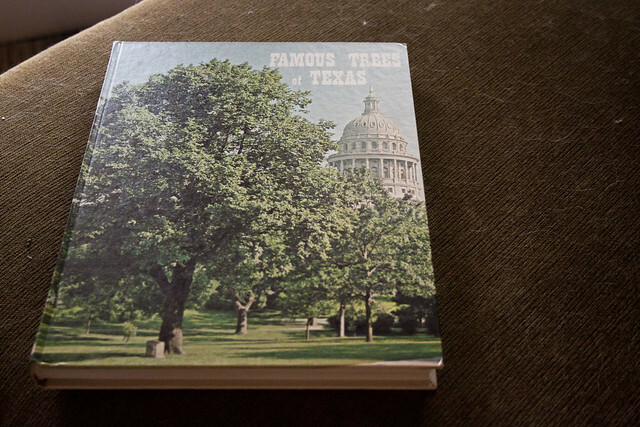 I picked out one called Famous Trees of Texas. Even though it was published in the early 70s, the book looked pretty cool and I told Chris we should try to find it. Lo and behold a few weeks later one arrived in the mail that he had bought off of Ebay. It had been sitting on our coffee table for the last few months when I decided last minute over the weekend to bring it with us to Nacogdoches when we went to theSFA plant sale. There were two in Nacogdoches that we could attempt to find. We hit up the first tree, the Old North Church Oak, a post oak, shortly after leaving the plant sale. Since I’d grabbed the book last minute we didn’t get a chance to map it online and see if we could figure out where it was. The description in the book was fairly clear and I figured we could find it. Of course when we started looking for it we couldn’t find Old Highway 35 on our Garmin, and the church’s original name or its newer name did not come up either. All we knew was that it was just outside of the city limits on Old Highway 35 off of U.S. 59. Well, there were a couple of things I should have put together as we were sitting at the light to cross over North Street and head for U.S. 59. North Street should have rung a bell to ‘Old North’ but also that North Street was Business 59…which meant in the 70s it was likely the original U.S. 59. Now U.S. 59 is diverted around town and Business 59 replaced it the original U.S. 59. I didn’t think of this until we were outside of town and on the new U.S. 59 and we kept looking for signs for Old Highway 35 or any kind of old church just off the road. When I mentioned to Chris what I thought about the real meaning of U.S. 59, we got back onto Business 59 and headed south. On our way into town we found the city limit sign—something else we were wondering was if the city limit had changed in 40 years—and decided to try the first county road we saw. 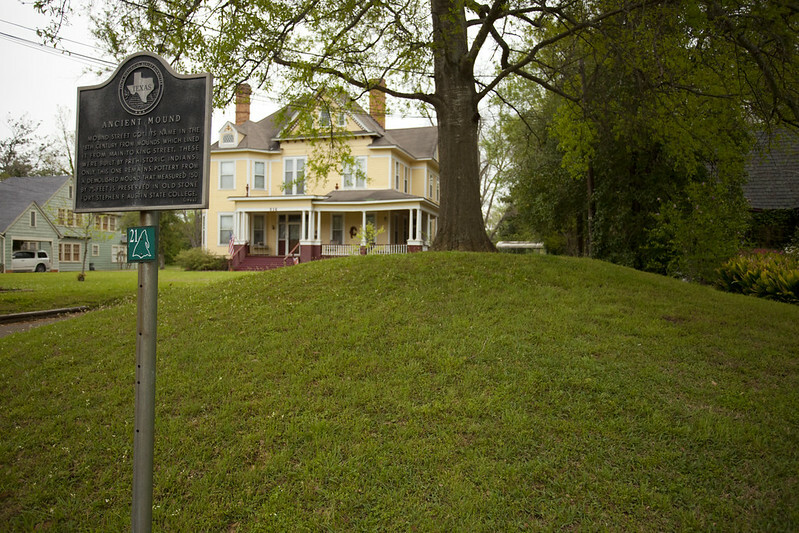 When we u-turned to get back to the county road we saw a brown historical marker sign, which gave us hope. And sure enough, we found it! I expected the place to be deserted, but there were three older women there checking out the tree and the cemetery. When we approached they asked us if we had relatives buried there and told them we’d only come for the tree. The woman had gone to the church when she was younger and talked about attending revivals there. She and her friends/family were there mostly to visit the cemetery. We told her what we were doing and they were very intrigued and decided to photograph the book and the pages for the church and tree. She said the tree had been struck by lightning ‘several years ago’. 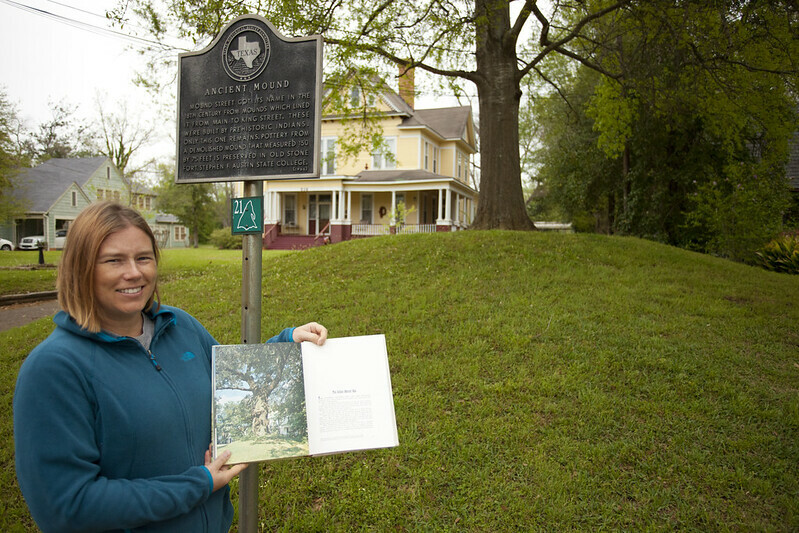 After taking a few photos we decided to head back into town for the next tree, the Indian Mound Oak. 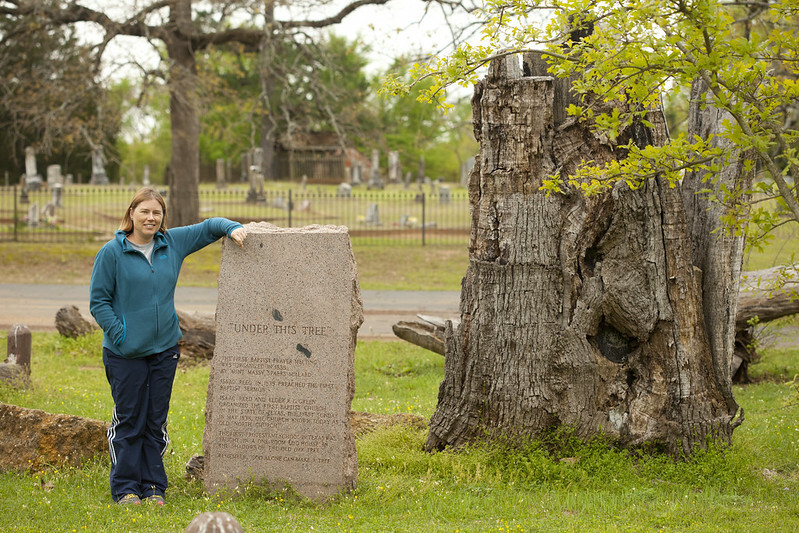 This tree was said to be a southern red oak on top of a small Indian mound across from a highschool that had originally been Nacogdoches University back in the 1850s. Apparently there had been several other mounds that were pushed over to build the university. We found the street for this tree easily and could make out the old highschool which was now a middle school, but we drove right by the mound. I’m not sure how we missed it as when we came back it was pretty easy to see. I think the problem was that the oak was gone and instead a smaller oak was in its place. The southern red oak was now medium sized water oak. 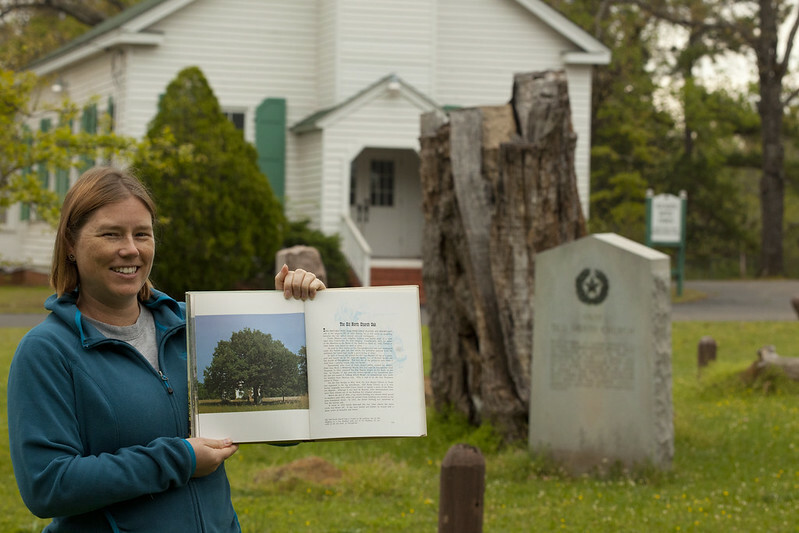 We looked back at the photo in the book and thought maybe some of the shrubs that were growing around the oak may have been this oak as a sapling. Maybe one day this water oak will be as majestic as the oak in the book appeared to be. As I researched writing this post I found the website for the book. It appears that quite a few of the trees in the book are now dead, which I guess shouldn’t be surprising. I think we should still attempt to find the locations of the trees that are dead anyway just for the historical significance. I bought that book at a used book store a few years ago. I never thought to look for a website related to the trees in the book. Thanks for the link. It is interesting to see what happened to them some 40 years later. Sad to see that so many of the trees have died. What a SUPER cool project- that is so creative! My spouse and I absolutely love your blog and find almost all of your post’s to be just what I’m looking for. subjects you write about here. Again, awesome blog!